When a developer demolishes the century-old Williamsburg Court Apartments in downtown Seattle this year, 49 households will have to find new homes. They include a high-school math teacher, hotel concierge, classical trumpeter, restaurant manager, theater coordinator, a writer and two executive chefs. Across the street at the high-rise apartment tower Aspira, a one-bedroom unit starts at just under $2,000 — more than twice what many residents pay at the three-story Williamsburg Court. The Seattle metro area is witnessing a historic boom in apartment construction: More than 7,000 units opened last year in King and Snohomish counties, including many in downtown Seattle. At least 10,000 more will open this year, and perhaps 14,000 next year. But the bustle of new residential and commercial projects produces a largely unseen side effect: Renters of modest means are being pushed out. Older apartments and single-family houses, both a major source of affordable market-rate housing in the city, are being demolished at a fast pace. As a result, 304 Seattle households were displaced last year, compared with 118 in 2012, according to the city. Renters in older, mediocre properties also are seeing bigger rent hikes than renters in newer apartments, perhaps because those of modest means have fewer affordable alternatives. “You could raise your rents pretty aggressively without risking losing your renters to a new apartment property,” says Jay Parsons, director of analytics and forecast at Texas-based MPF Research. These households are entering the most expensive rental market in modern memory, one buoyed by high-tech job growth, low vacancies and an almost insatiable demand for urban apartments. In the first quarter, the average rent on new leases in King and Snohomish counties rose 6.8 percent from a year earlier — more than five times the general inflation rate — to $1,233 a unit, according to Seattle-based Apartment Insights Washington. A one-bedroom in downtown Seattle? About $1,800 a month, on average, according to Dupre+Scott Apartment Advisors. More than 80 percent of properties in Seattle and King County plan to raise rents in the next six months, by an average 4 percent, Dupre+Scott reports. Lower-income renters are “pretty much being pushed out of the city,” said Edlira Kuka, a tenant counselor at Seattle nonprofit Solid Ground and aide to state Sen. Jeanne Kohl-Welles, D-Seattle. The Seattle metro area now ranks sixth among the nation’s metros in annual rent growth, behind three Bay Area cities, Portland and Denver, MPF Research reports. 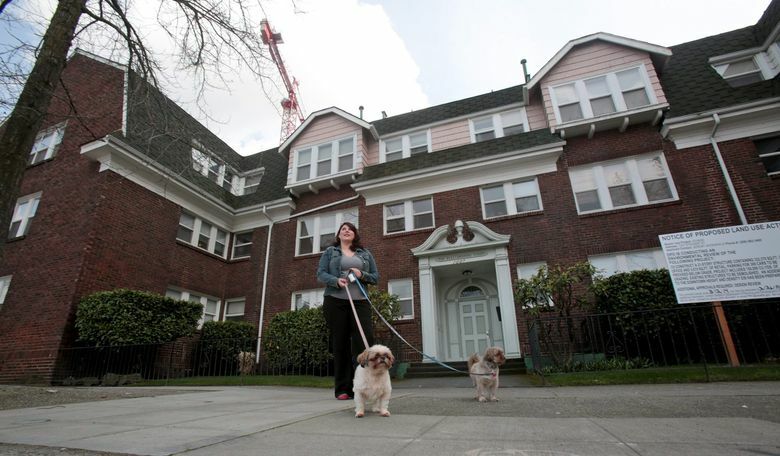 “Seattle’s just grown up to be a big city,” said Barbara Stephanus, 84, who with her husband bought the Williamsburg Court property in 1979.
, which will close the deal after the city approves a $50 million plan to construct a 21-story office tower. Amid the glass-and-steel high-rises in Denny Triangle, the Colonial-style Williamsburg Court Apartments is an anachronism. It was built in 1912, when the area south of Lake Union and north of downtown was a bustling industrial nexus with commercial laundries and factories. Developers built apartments nearby for immigrant workers in those plants, including what is now Williamsburg Court. Today’s residents are mostly in their twenties and thirties, but there are some much older long-timers, too. Many are pursuing careers in fields that don’t pay well, such as education, the arts and hospitality. 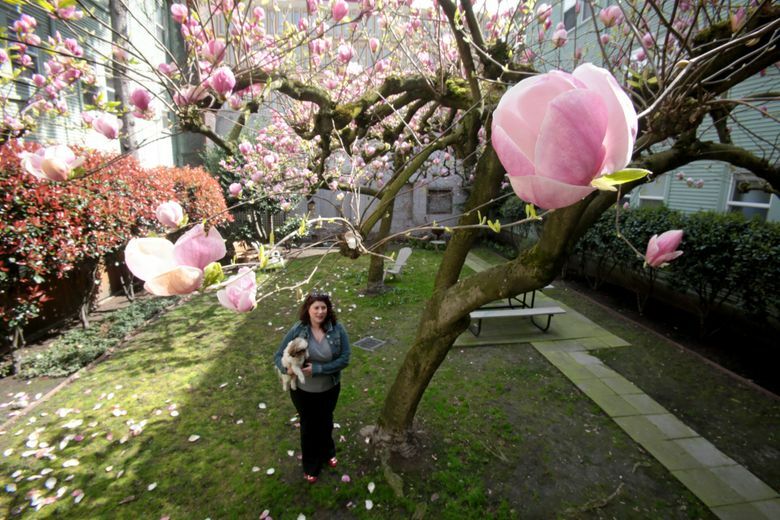 On good-weather days, residents gather in the inner courtyard to barbecue, let their dogs out or just lounge under the large magnolia trees. When a resident’s black cat kept sneaking out her window into the courtyard at night, another resident installed a carpeted ladder to help the feline return to her owner. When a resident getting his doctorate in music from the University of Washington practiced his trumpet at night, neighbors didn’t complain — they said bravo. And when a formerly homeless man suffering from mental illness moved in, neighbors cared enough to help him furnish his apartment. They gave him a television, microwave, table, floor lights, even an Xbox and a computer, noting his interest in gadgets. Now that resident, who declined to be named, is heartbroken he’s going to lose the community of diverse people it’s taken him four years to build. Williamsburg Court is one of the last frame apartment buildings from the city’s early 20th century industrial boom. In 2007, a historic preservation consultant prepared a report on Williamsburg Court, which the city was considering nominating for landmark status. The owners opposed the move. In 2010 the city’s Landmarks Preservation Board rejected the nomination on a 3-7 vote, saying the building’s exterior had undergone too many changes to meet landmark criteria. Trammell Crow submitted its plans last fall and applied for a tenant-relocation license that’s required by the city before it will issue any building permits. Households making less than half of King County’s median income are eligible to receive about $3,200 in tenant-relocation assistance, with the cost split equally by the city and developer. But they must apply within 30 days of receiving a notice from the developer. Last year 172 households received just over $507,000 in assistance, city figures show, up from 37 households in 2010. Out of the 49 households at Williamsburg Court being displaced, 13 have applied for relocation money. While the amount of assistance is increased periodically, rents have risen much faster. Older, mediocre apartments, which enjoy lower vacancy rates than newer and nicer properties, have been a bit more aggressive in raising rents. In King and Snohomish counties, the middling apartments are asking $1,235 for rent — 7 percent higher than last year — while the top-quality ones are asking $1,825, about 5 percent more, according to data from Seattle-based Apartment Insights Washington. “One can expect the market to weaken, but at what point no one knows. That’s the big question,” said Tom Cain, head of the apartment market-research firm. The lowest rents in the area are in Burien, SeaTac, Tukwila and Marysville, but those also have some of the lowest vacancy rates. But tenants in these outlying areas are seeing rent hikes, too, said Kuka, of Solid Ground, which served about 4,000 Seattle residents last year through its tenant advocacy program. Some displaced tenants find they can afford only similar older, rundown buildings — just to find themselves displaced again when their new abode gets redeveloped. That’s happened to a few residents at the Williamsburg Court, including Ray Etheridge, a high-school math teacher who’s lived there since he was displaced six years ago from the former 61-unit Virginia Apartments a block away. Etheridge, 51, who pays $777 a month for a 650-square-foot unit, said the management of Williamsburg Court has been helpful suggesting other properties, which too are owned by the Stephanus family. He’s considering a smaller apartment in Capitol Hill that’ll cost $100 more a month; if he wanted something the same size, he said, his rent would go up by $250. While Etheridge doesn’t blame the owners of the Williamsburg for selling, he’s frustrated by what’s happening to him and his fellow residents. He’s alarmed by the $2,000 rents being quoted at new apartments nearby in Capitol Hill. The people who make up Williamsburg Court are the people the city should be trying to retain downtown, he said. The clock is ticking for the Williamsburg Court’s residents. They expect to be out by the fall. Lustica fears she won’t find an affordable place within walking distance to her two jobs, one at a big hotel and the other in a retail store. Isis Miranda, 28, fears she won’t find a landlord willing to let her keep her dog, parrot, fish and snake. Etheridge, the high-school teacher, fears Seattle is becoming the next San Francisco. Stephanus, the building’s co-owner, said her business is owning places for people to live. While what’s happening to Williamsburg Court is sad, she said, if people can’t afford downtown living, that’s for them to figure out.